Sheilacakes: Campus Quilt Company Review and Giveaway!! Campus Quilt Company Review and Giveaway!! I am one of those mothers who keep all of her child’s clothes. I have only thrown away two pairs of pajama pants that were a complete mess. So I have boxes and boxes of my son’s clothes. I know some people like to donate clothes or give them to a family member which is wonderful but someday I hope to have more children. I have always wanted to make a quilt. I remember when I was younger; I started cutting out fabric squares with my grandma. I am pretty sure somewhere in the garage in a tote are those fabric squares. I really wanted to make a quilt. The problem is I can’t sew. I tried to make a purse out of a t-shirt and it is the weirdest looking thing. So, when I had the opportunity to have a quilt made for me by Campus Quilt Company. I was so excited. 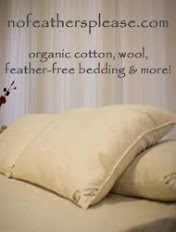 Campus Quilt Company is this wonderful online business that does all the work for you. They have two different types of quilts T-shirt quilts and wee quilts. My sister is the queen of t-shirts. When she was in high school she had a whole armoire full. My mom called it the t-shirt store. I never really had that many t-shirts so I decided to make a wee quilt. Hey, wives? Does your husband have a bunch of goofy t-shirts that have extreme sentimental value? You could make a t-shirt quilt and free up those dresser drawers or closet space! Campus Quilt Company sends you a quilt kit when you order. When I heard quilt kit I thought do it yourself, thankfully I was wrong. Basically you send them the clothes you want on the quilt and you pick what fabric you want for the backing and if you want extras like sashing or embroidery. It’s a really easy process to ship it to them. They send you the label and everything. You even get email updates through each step of the process. I had fun going through Noah’s baby clothes. I would see something and I would remember how cute he was in it. Most of the clothes have been put away for a long time so it was nice to see them again. I carefully selected the clothes I wanted on my quilt. I was a little nervous about sending them because they were my baby’s clothes after all. I was put at ease the next day when I got the email that they received them.I was really excited to see what they had done. I wasn’t too picky about the layout or the sashing color, I gave them creative freedom. They are the experts. So, then I just had to wait to receive it back. I was extremely excited that it took only a week to get it done and back to me from when I dropped it off at UPS. Normally it takes 2 to 3 weeks. It just depends on your order and how busy they are etc. You have the option to rush it as well. Incase you need it for a certain occasion like graduation or Christmas. The day my quilt arrived I was really anxious to see it. I was nervous as well. When I opened the box and laid it out on the table, I was speechless. I started crying. It was absolutely beautiful. I had to show my family how beautiful it was. Everyone was amazed. I thought that the clothes were going to be just kind of hanging there. Not at all, they are completely sewn in. I am going to hang it on my bedroom wall. I had them attach one of Noah’s old pacifiers on there and I learned really quickly that he wanted it. He tried to take it off the quilt. Thankfully he didn’t succeed. I was so impressed by my quilt. Now I have a constant reminder of the days when my son was a baby. Every time I look at it I smile. I put some clothes that were gifts from family and friends too. I am sure they will be extremely touched that their gift made it on my gorgeous quilt. I am sure the pictures speak for themselves. There are hundreds of pictures on the website as inspiration too. I can’t say enough good things about my quilt and how much I truly love it. These quilts would be the perfect gift for anyone. You could make a wee quilt for Grandparents or your spouse. The t-shirt quilts would be a great graduation gift or even a wedding present. You could use your quilt as a family heirloom and use clothes of different family members. It would be a very touching way to remember a loved one that has passed away. The possibilities are endless! As long as they can stick a needle in you can get it on your quilt. There is the option to get photos on your quilt too. I really love my quilt. It went well over my expectations and I will be recommending anyone who is in the market for a quilt to check out Campus Quilt Company. It is about the same price as a quality quilt from a department store but it is special because it is personalized to the owner. It is definitely worth the price. It is high quality and I will cherish my quilt for many years to come. I know someday when Noah is all grown up, I can look back and just smile. Thank you to Campus Quilt Company for sending me a wonderful quilt to review and sponsoring this giveaway. I have a giveaway for you all! I have a $150 gift card for Campus Quilt Company for one lucky person. Mandatory Entry: Go to the Campus Quilt Company website and look around and tell me what kind of quilt or gift you want to make. Please tell me the type and size. You must do the main entry for the bonus entries to count. Subscribe to my blog via email you must verify it. Follow @sheilacakes7 on twitter and tweet about this giveaway and put the link in the tweet. This can be done once a day. Please link me to the tweet in the comment. This giveaway will end on October 30th 2009 at 11:59 pm ET. I would get the lap quilt with sashing, and I would use all my old concert t-shirts! 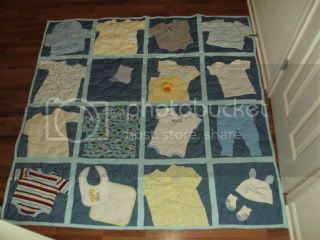 I would choose the T-shirt Quilt and I would use my grandson's clothes and my kids and husband. and my mom's pictures/designs on used on it!! Oh how I would love one of those Wee quilts to put my kids baby clothes on! I would get the 12 Squares - Picnic T-Shirt Quilt with my dd and dh's sports uniforms. It would certainly become a family heirloom. These are beautiful! I would get the 25 square quilt with all my old U2 t-shirts. I would choose the 25 square quilt and use my some my son's t-shirt collection. I would give it to my son for his 21st birthday in December. Wouldn't that be a special gift! I would like to have a 25 square photo quilt! I would get the 12 square picnic quilt and put my husbands old t-shirts on it. Thanks! That is gorgeous! I want a wee quilt with 16 square very badly. You did a wonderful job with the review too. I would keep this quilt as a memory of the baby days. I'd love a 16 square tshirt quilt! Thanks!! i would choose the 36 square quilt and make a quilt of all my old running t-shirts from races. BUT i cannot get over how sweet your quilt is. That is such an incredible idea. this quilt (selfishly!) would be for me! I've always always wanted to have one made! 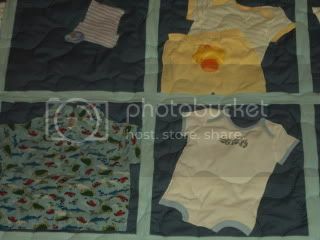 I would get the 9 square wee quilt with an ivory backing for my son's baby clothes. I would get the 12 squares picnic t-shirt quilt and use my younger brother's shirts. It would be a present for my mother. I would use some of my old t-shirts from school to create a 12 Squares - Picnic T-Shirt Quilt. I have a friend who makes tie dye and I think they would make a great quilt. I would use t-shirt that my kids no longer want to make a 20 square- Couch T-shirt Quilt size 6'3" X 5'. the 42 square t-shirt quilt is the one that I would choose. 9 Squares - Lap T-Shirt Quilt for my husband! he has so many t-shirts from bands lying around the place. I woudl probably get the T shirt quilt for my cousin! I like the 12 Squares - Picnic T-Shirt Quilt. I would like a Queen Sized Tshirt quilt. I would love to win this. I would choose the 9 Squares - Lap T-Shirt Quilt. I am not sure of the shirts I would choose. I do know they would be a mix of my husband's shirts and my shirts for my son. In case something ever happened to us. I would also get his name embroidered on it. Thank you for the giveaway! I'd get the Picnic T-Shirt Quilt. I would like the 9 Square Wee Quilt for baby clothes.